As children work their way through preschool and kindergarten curriculum, they will learn to add single digit numbers. Many children, with a great number sense, can figure simple addition problems out easily. Others need extra support with lots of visuals. Adding mats are a great way for children to practice adding by counting objects, and they get to practice writing their numbers. 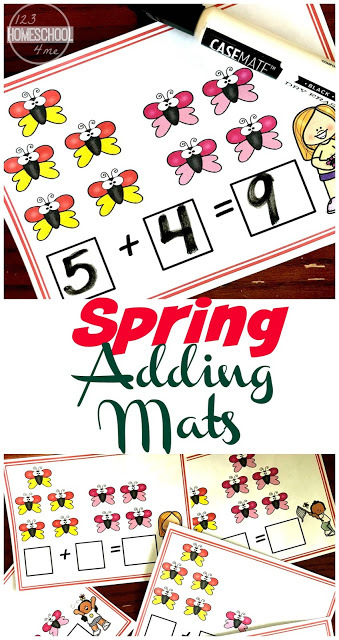 And these butterfly adding mats are a great addition to any springtime math center. It doesn’t take much work to get theseButterfly Spring Addition Mats ready to use. First, print them off on card stock paper and then cut them out. Finally, gather up some dry erase markers and you are ready to go. These cards are very simple to use. And once they are laminated you can use them over and over to practice adding….which is much better than using a worksheet over and over. 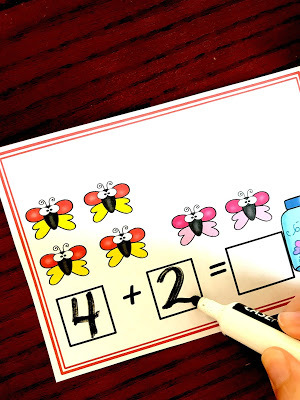 The first step is to have the children count up the yellow butterflies, and then write that number in the first square. 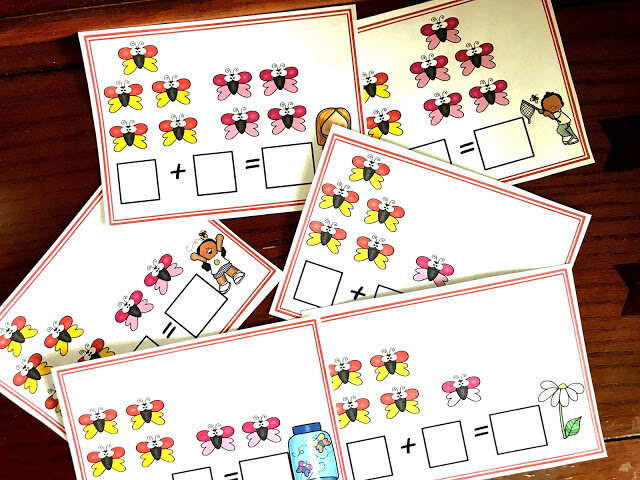 Next, the children will count the pink butterflies and write that number in the second box. Finally, it is time to add. Once the children figure out the answer they write that number in the last box. 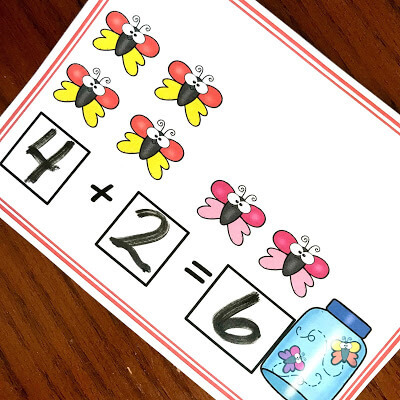 After counting up each set of butterflies, children may struggle to figure out what the answer is. In this case, you can show them two different ways of adding. One easy and simple way is to explain to the child that adding is finding the sum. It is figuring out how many objects there are altogether. 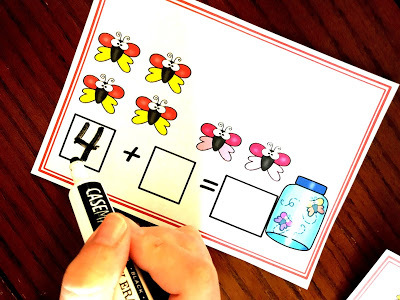 Using that language while explaining to a little one that they simply have to count up all the butterflies is a wonderful way to build background knowledge. With that background knowledge, they will be more successful when it comes time for word problems. These task cards don’t have a ton of butterflies, so counting each one isn’t a bid deal. But as numbers get larger, you don’t want a child to only be able to count all the objects to figure out the answer. 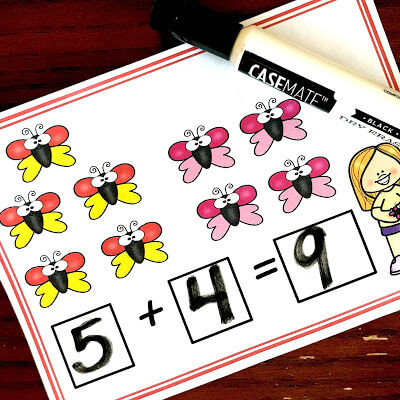 Counting on is a great strategy…..and it will help them with subtraction too!! Ask them how many yellow butterflies there are. If they can’t remember, point to the first number they wrote down. Finally, begin counting the pink butterflies starting with that number. Enjoy some springtime, and getting some extra adding practice. Rachel is a homeschool mom to four little ones, ages 2 to 6. She is a former public elementary teacher, and has recently began blogging at her page You’ve Got This.